This one came from eBay in August of 2010. 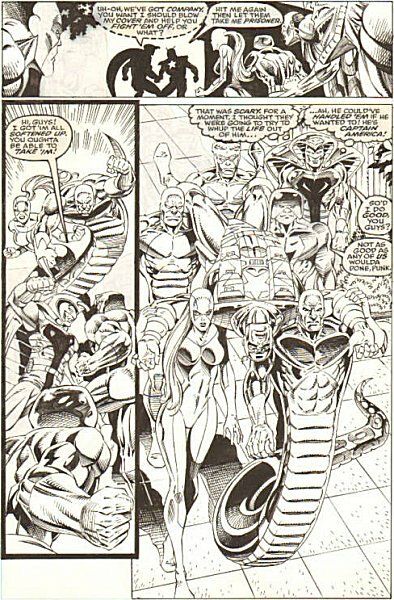 I was iffy on it as one of my other Serpent Society pages is already by Dave Hoover, but I really like the play that Bushmaster (the guy with the snakelike body) gets on this page. So, I put in a bid at the starting level, and was surprised when I was the only bidder and won. As I said, I was iffy on it before bidding, but with it in hand, I'm very happy. I note elsewhere about my other Hoover Society page (Captain America 437, page 8) that I love the colored page in the published book, but in black and white the art is very complex and its actually hard to tell what's going on. This page seems a bit simpler, but upon getting it I've discovered that it was not always so! In panel two (lower left), Puff Adder was originally above Cottonmouth but was pasted over; similarly something was at the left above Cobra's fist, though I can't quite tell what it was. If you squint, you can see him vaguely ghostlike in the scan. In panel three (lower right), Rock Python and Anaconda were originally both in the very top left, and where Rock Python actually appears in the page was actually originally someone else (again, I can't tell who). In total, between both panels three snakes were removed after the inking. You may see another 'ghost' in the top panel, but that appears to have been simply a matter of them moving that 'ghost' back and replacing him with the figure currently at far left so as to increase the apparent distance between him and the silhouettes. I'm reading into this all that editorial agreed with my contention that the pages were somewhat overcrowded, but I always really enjoy pages that give me a slight glimpse into the behind-the-scenes processes at Marvel.